Large four bedroom Grade II listed Victorian house requiring modernisation. 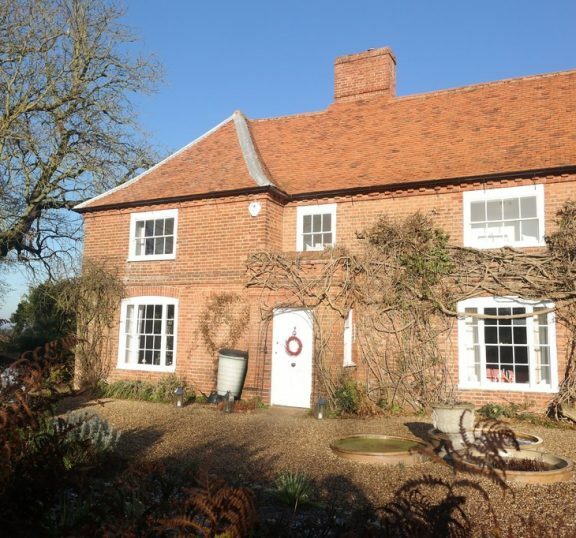 The property offers excellent sized accommodation and comes with a plot of around a third of an acre. The A12 is situated close to the front of the house, while at the rear the garden backs onto the village sports field. RECEPTION HALL Radiator, stairs to first floor. SITTING ROOM 14' x 13' 4" (4.27m x 4.06m) Radiator, secondary glazed sash window to front, French doors to side, fireplace with red brick surround. FAMILY ROOM 23' x 10' (7.01m x 3.05m) Double glazed window to rear, radiator, French doors to side, fireplace with red brick surround. STUDY/UTILITY ROOM 10' 9" x 10' (3.28m x 3.05m) Double glazed window to rear & side, oil boiler. KITCHEN 16' 3" x 11' 6" (4.95m x 3.51m) Radiator, tiled floor, double glazed windows to rear & side, stainless steel sink unit with mixer taps, work surfaces with drawers and cupboards under, electric cooker. UTILITY ROOM 6' 5" x 5' 5" (1.96m x 1.65m) Frosted window to side, plumbing for washing machine. CLOAKROOM Wash hand basin, low level w/c, frosted window to side. BEDROOM 10' 8" x 10' 0" (3.25m x 3.05m) Radiator, window to rear. BEDROOM 11' x 10' (3.35m x 3.05m) Radiator, window to rear, built in wardrobe. BATHROOM 9' x 6' 9" (2.74m x 2.06m) Window to rear, panelled bath, wash hand basin, low level w/c, fitted shower. LANDING Radiator, access to loft, window to front. BEDROOM 14' 2" x 13' 3" (4.32m x 4.04m) Secondary glazed sash window to front, radiator, tiled fireplace. OUTSIDE The whole plot measures just over a third of an acre. The front boundary is secluded from A12 with mature conifers. In and out driveway, ample parking. Car port/garage to be built. Large rear garden laid to lawn.